Whatever your view is of internet boycotts, Left 4 Dead might be the first critically acclaimed franchise whose announcement of a sequel was answered by nearly 10,000 fans pledging not to buy it. There are accusations and recriminations that Valve forum posts referencing the boycott have resulted in sanctions, removals, and banishments (or "points" accrued toward such action.) And you can tell a movement has hit its stride when it gets a Hitler-Downfall Meme video (which is, all things considered, kind of funny. Especially the bit about achievements). When L4D2 was announced at E3, my first thoughts held cheap my copy of the first game. Even after reading McWhertor's extended impressions, I'm not really seeing how this sequel doesn't do something a series of DLC packs couldn't also accomplish. Maybe I'm not a game developer; so are a supermajority of L4D players, and so Valve will have to answer these questions right up to its release date, and then some. For in all its justifications of L4D2, Valve is going to be faced with its own history regarding Team Fortress 2, one of the standard-bearers for how DLC can help evolve a game and sustain fans well after its release. Even if TF2 began as (and its updates remain exclusive to) a PC game, argumentatively, everyone will ask why the same thing can't be done with L4D, or at least its PC version. 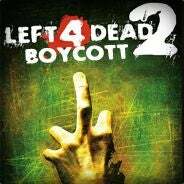 That's about as down-the-middle as I can play it, because I do respect Valve's perfect right to do what it wishes with its own IP, and anyone in the industry would agree the success of L4D fairly demands a sequel. But doing it so soon, and in this form and context, one of the most respected and evangelized brands in gaming risks taking a dent to its reputation. The game we see in November must be night-and-day different from the original, and I don't mean new maps set in the New Orleans sunshine.